No real need to wonder if these politicians noticed it is their job to make sure the VA takes care of our veterans. After all, they had the authority since 1946, ergo, if the VA has problems, it was their job to fix them. So why didn't they? Why would they want to spend this kind of money on private healthcare providers instead of actually fixing the problems with the VA? Easy answer is, private healthcare providers will make a lot more money off "treating" our veterans. Veterans not only deserve the best care this nation can give, but should never have to settle for the least lawmakers are willing to do! None of these problems veterans face are new ones. Shulkin is seeking emergency funding or authority from Congress to transfer money from a community care account that holds about $2 billion. Currently, he does not have the power to move money between the accounts. 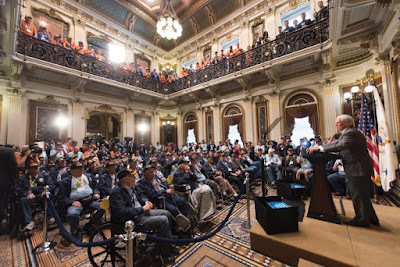 Vice President Mike Pence speaks at the White House Eisenhower Executive Office Building in Washington on May 8, 2017, as veterans from Colorado were in town participating in an Honor Flight event. A host of veterans issues are slated to be addressed as lawmakers return to Washington following the July 4th holiday break. WASHINGTON — As they return this week from a July Fourth break, lawmakers are set to discuss Department of Veterans Affairs health care, its 2018 budget, how veterans are affected by the opioid crisis and how the VA handles claims for Gulf War Illness – all while facing a short timeframe to do something about quickly diminishing funds in the VA Choice program. Choice funding VA Secretary David Shulkin warned lawmakers June 16 that money was unexpectedly running out for the Choice program, which allows veterans to seek health care outside the VA. Despite projecting the VA would roll over $626 million for Choice funding into the next fiscal year, Shulkin said the fund would be depleted by Aug. 7. He attributed the faster spending to the increased popularity of the program among veterans this year. Now, there’s concern that without action from Congress, more veterans will have to receive care within the VA, creating longer wait times and adding stress to the system that the Choice program was meant to alleviate. A Senate Appropriations subcommittee will propose a fiscal 2018 VA budget at a Wednesday meeting, which will be followed by a full committee markup of the proposal Thursday morning. Last month, House appropriators proposed a $182 billion budget for the VA, an increase from 2017 levels but still short of the $186.5 billion Trump is calling for.